As a member of the Healthy Aperture Blogger Network, I was asked to participate in the #SoyInspired campaign. I was compensated for my time. Thanks for supporting Hummusapien! There are exactly 31 days between now and Thanksgiving. That’s only 744 hours. Or 44,640 minutes. That’s a hot number of minutes, no? I love the holidays. Everyone is hungrier and happier. Even though I don’t eat the main dish at the Thanksgiving table, I love turkey day food just as much (if not more) as the next person. I live for mounds of stuffing and green bean casserole and mashed sweet taters. This holiday season, we’re getting #SoyInspired! 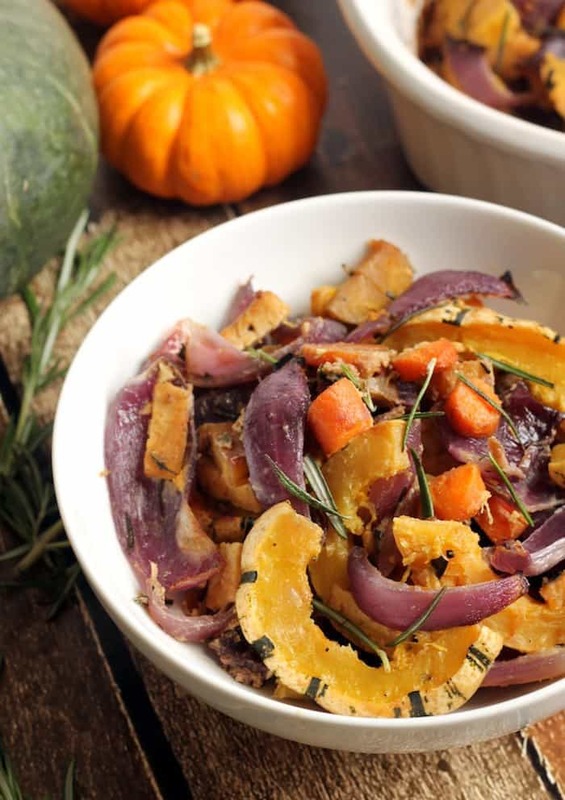 Whether you’re whipping up a vegan pumpkin pie with creamy silken tofu or using vanilla soymilk in your mashed sweet potatoes, wholesome soy products are a yummy, cholesterol-free way to boost the plant-powered protein content of a dish. Use the holidays as an opportunity to explore in the kitchen! Because most soy products have such a mild flavor, they’re super easy to sneak into seasonal recipes. The star of this stuffing show is tempeh. I absolutely adore the nuttiness of tempeh. Unlike its often hated-on tofu cousin, tempeh has a nice firm texture. It’s also packed to the brim with protein, fiber, and gut-friendly bacteria. Basically you can make a full meal out of this side dish. DING DING DING WE HAVE A WINNER HERE! Let’s state the obvious here. This isn’t the traditional stuffing because of the whole no bread part. I didn’t intend on calling it stuffing at all until I realized it kind of tastes and looks like stuffing. I spoke personally to the stuffing police and they said the breadless nature of this dish is a minor detail. It tastes like stuffing, and that’s all that matters. It tastes like dreams, in fact. Arman said it was one of my finest offerings thus far, and that’s saying something. There’s magic in the marinade. 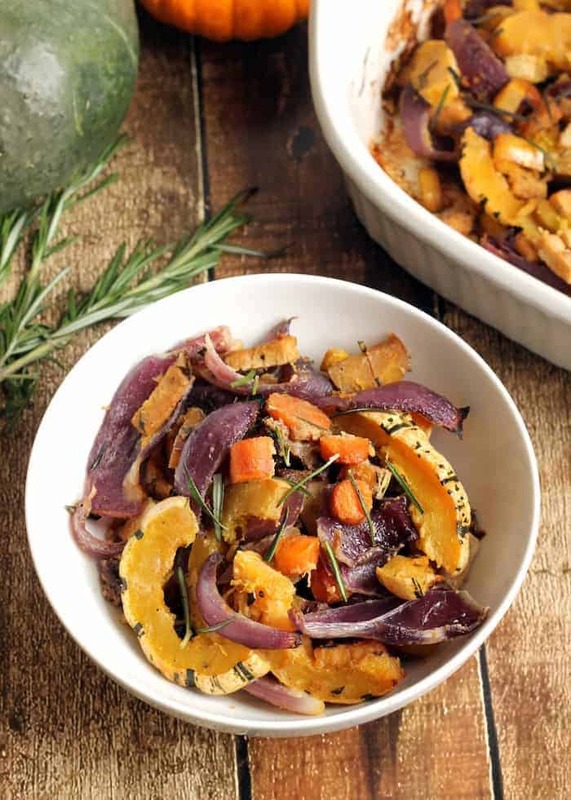 Also can we talk about the fact that you don’t have to peel delicata squash?! An edible peel is a seriously incredible invention by Mother Nature. If my dreams tasted remotely like this stuffing, I’d get a hell of a lot more sleep. Hearty Vegan Stuffing is an easy, gluten-free, and DELICIOUS Thanksgiving main meal or side dish that the whole family will love! Whisk together maple syrup, tahini, olive oil, apple cider vinegar, soy sauce, and garlic in a large bowl. Add tempeh and toss to combine. Set aside. 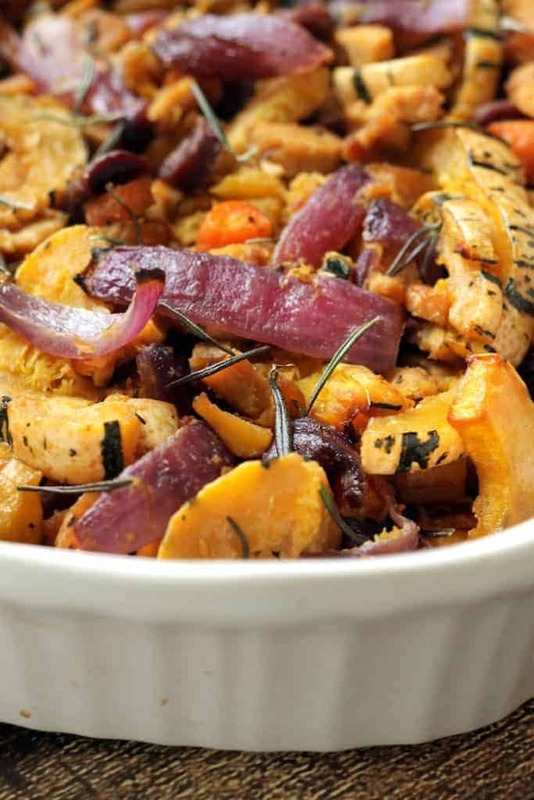 Place carrots, onion, squash, and rosemary in a 9x13inch baking dish. Add olive oil, salt, and pepper, tossing to combine. Roast for 35 minutes. Remove veggies from oven. Add tempeh and marinade, stirring to combine. Bake for another 20-25 minutes, or until veggies are cooked to your liking. Garnish with more chopped rosemary prior to serving. 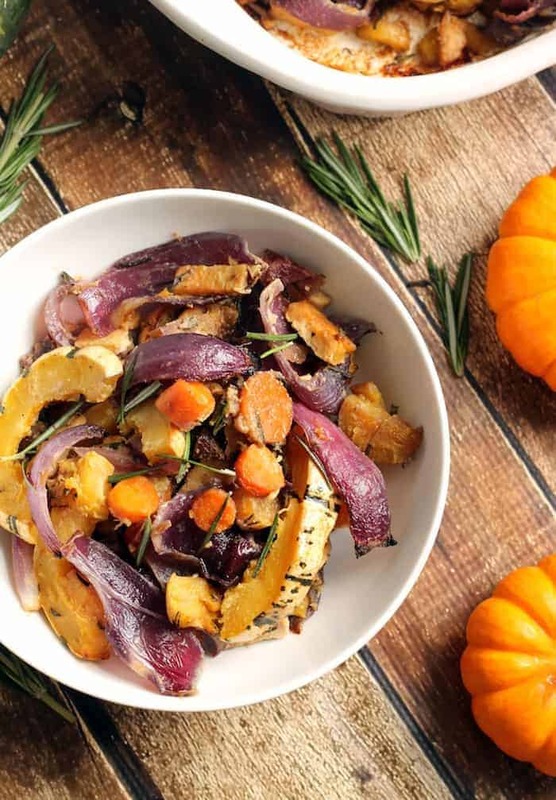 I love this vegan spin on a classic thanksgiving side dish! Yay for delicate squash! And freaking out that this is VEGAN. You are amazing girlfriend. How dare you use my name in vain. People who read this- I was only offered this dish and a sprig of kale. My options were limited. Oh boy, do I wish I had tempeh in my life right now! This sounds like perfection! I am a Thanksgiving and holiday lover too!! :) Can’t wait for the season! This looks awesome. I’d be happy eating this anytime of the year – maybe even on top of a bed of greens as a salad! The fact that I can eat the skin is one of the #1 reasons I love delicata squash. Peeling is such a pain! I tried to get away with eating acorn squash without peeling it a few weeks ago and let’s just say my insides were not feeling so great after that haha. OMG totally did not even realize Thanksgiving was coming up so soon! Looks like the perfect recipe to kick off some Thanksgiving cooking! So I was eating roasted delicata squash off the sheet tray (for… brunch? snack? i dont know haha) as i saw this on facebook, so perfect timing and it looks SOO good! i love the added tempeh ! This comment made my day!! And I totally agree that would name would rock. It’s people like you that keep me motivated to put out the best recipes I can. Have a great week!